MILITARY INTELLIGENCE | COURAGE FOR AMERICA! “It is bad feng shui to ignore the truth– by some disorderly arrangement of facts. As such, I am keeping my eyes on China.”–From My Eyes are on China. Are Yours? SAN DIEGO (Sept. 9, 2013) Chief of Naval Operations Adm. Jonathan Greenert, left, talks with Commander in Chief of the People’s Liberation Army Navy Adm. Wu Shengli during a visit to the control room of the Los Angeles-class attack submarine USS Jefferson City (SSN 759). 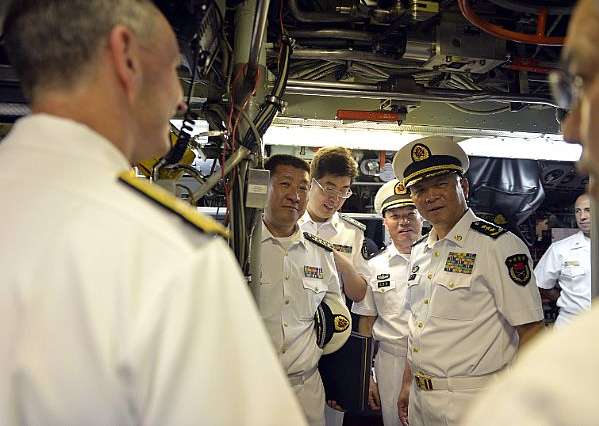 Greenert hosted his Chinese counterpart on a daylong visit around various Pacific Fleet commands in the San Diego area. China is our political and economic enemy– so China matters. My experience living under communism taught me never to trust China, nor any socialist government– because socialism is phase one of communism. On April 7, 2011, I began the series titled The Beijing Affair, now in its third part. The Beijing Affair remains to this day one of the most popular series I have published. Part One of The Beijing Affair details the insidious sharing of military technology with the communists in Beijing. This deceitful and dangerous activity has also been disguised for a long time under programs labeled as “cooperation” and civilian R&D (Research and Development). Part Two covers our economic relationship with China. Part Three is centered on the bloody persecution of the Underground Catholic Church in China. To China with Love (published in CourageforAmerica.com). 胡锦涛 and the United States: The “Rehabilitation” of America. My Eyes are on China… Are Yours? (also published in CourageforAmerica.com). This week, America’s sharing of military technology reached one of its worst moments, when the head of China’s navy had the red carpet rolled out before him, while he inspected the inside of a United States fast-attack submarine in San Diego Bay. All in the name of “dialogue”– with the enemy, that is. What a scenario! Vladimir Putin, a former KGB thug, is running our foreign policy in the Middle East– while the communists in Beijing inspect our exclusive naval assets. Socialists everywhere, including Barack Obama, must be celebrating America’s participation in this “equitable” distribution of power. In stead of protecting our military assets, United States military officials appear to be more interested in bending over backwards to assert the “rights” of homosexuals and their sexual partners, so that they are openly welcomed and protected under an eroded military code of conduct– something that even a communist like Vladimir Putin will not tolerate in Russia. Chief of Naval Operations Adm. Jonathan Greenert, Chief of the People’s Liberation Army Navy Adm. Wu Shengli, China, Dialogue with the enemy, Marielena Montesino de Stuart, Marielena Speaks, Marielena Stuart,THE U.S. NAVY: The love affair with Beijing continues, U.S. Navy.